WINNER: ZEFFIRELLIS, LAKELAND BOOK OF THE YEAR AWARDS 2016! 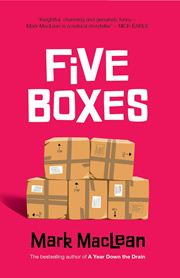 Following its release in Australia, Five Boxes, is now available in the UK. I was recently on BBC Radio Cumbria's Gordon Swindlehurst show (I start at about 1 hour 10 minutes in) and featured in the Evening Mail (waiting for the URL on that one). You can also hear my interview on ABC National's Conversations show with Ellen Fanning. Find out more about A Year Down the Drain, The Oldest Man in the Universe Goes to Groovin' the Moo, The New Landscape or A Short History of Ireleth & Askam-in-Furness.